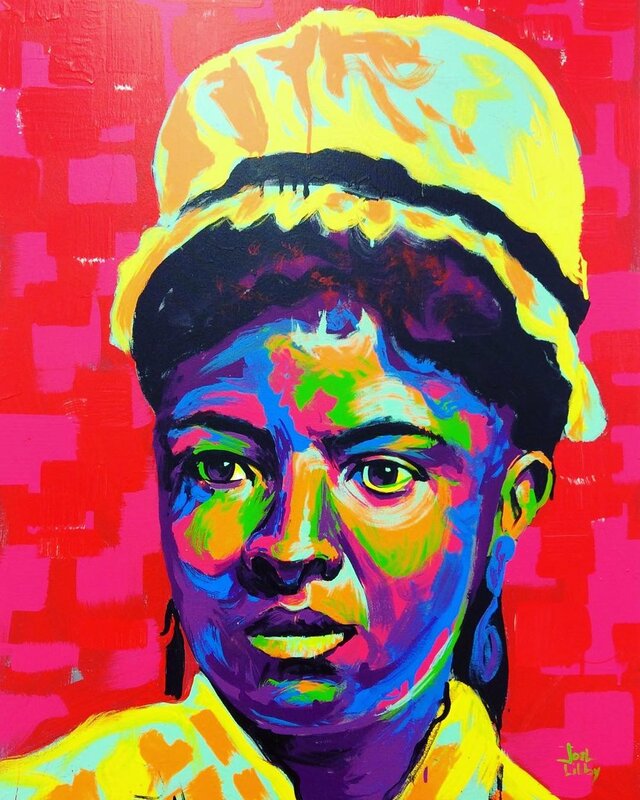 Mary Eliza Mahoney was the first African American to study and work as a professionally trained nurse in the United States. Flourishing in a predominately white society, Mahoney graduated in 1879 from the nursing program at the New England Hospital for Women and Children. She accomplished this at the age of 33 after having worked menial positions at the same facility for 15 years. In 1908, Mahoney co-founded the National Association of Colored Graduate Nurses, an organization created to eliminate racial discrimination in the nursing field and to recognize talented minority nurses who would otherwise go uncelebrated. 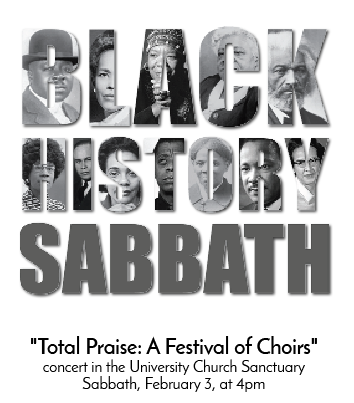 On Black History Sabbath in particular, the University Church community intentionally takes time to celebrate the irreplaceable contributions of African Americans in our collective past and present, to identify injustice that we must continue fighting, and to worship our Creator together in the rich and beautiful African American tradition. Please join us for an annual tradition as musicians from around the Northwest join together to share fabulous music in the African American tradition. All are invited! Welcome to our annual Black History Sabbath. For more than two decades, the University Church has dedicated the first Sabbath in February to honor and celebrate the rich and vibrant history of African Americans. Today we invite you to experience all aspects of worship in traditional African American style as we lift our voices in song, bow our heads in prayer, and open our hearts to the spoken word. We are blessed to have as our guest speaker, Dr. Hyveth Williams from the Adventist Theological Seminary at Andrews University. She will be gracing us with two different sermons for First and Second Service. And we are thrilled that for the fifth year in a row Dr. Wayne Bucknor and Dr. Andrew “Benji” Young are joining us from Oakwood University to lead out in our music. We are also excited to have the Gospel Choir from Portland Adventist Academy (PAA) join us for our worship service. Together with other vocalists from around the Pacific Northwest, they will form a mass choir that will be singing during Second Service. This afternoon at 4pm, we invite you to the annual “Total Praise: Festival of Choirs.” This concert will include a wide variety of musical selections, and will feature vocalists from around the Northwest, the PAA Gospel Choir, and the mass choir under the direction of Dr. Young and accompanied by Dr. Bucknor. Join us for this uplifting annual musical tradition. Thank you for your generous support of the local ministry of the University Church. Your donations in tithe envelopes marked "Local Church Budget" and loose offering today support important initiatives like Sabbath worship services, children and family ministries, Rogers Adventist School and WWVA, and our broadcast ministry. On Monday, January 22, the University Church board in business session voted to approve the 2018 budget. Board members and church leadership encourage you to consider giving regularly this year to the important and fruitful work of the University Church! Our new online giving platform allows for you to set up an automatic contribution plan! Learn more at wwuchurch.com and click "Give." Duwain Warner has been hospitalized recently. Please remember him and his family in your prayers. All-church potluck is next Sabbath, February 10, at 1:15pm in the Fellowship Hall. All are invited! Roger’s School Winter Carnival, Saturday night, February 10 6:00-8:00 pm, at Rogers gym. There will be delicious food (burgers, cotton candy, bake sale, tapas, and more!) along with fun games and activities for all! SonBridge Dental Clinic is looking to fill the paid position of a Dentist at 3 days/week. Call Mel Lang at (509) 301-3460 if interested. Market With A Mission: Come enjoy delicious food, baked goods, specialty items, and live music. Stateline SDA Church Friendship Center, Sunday, March 4, from 4-7 pm. Proceeds will benefit our local Christian Aid Center/Rescue Mission. Jamie Jorge ~ Healing Music Concert Tour: Jaime Jorge, a world-class violinist, will be performing a free concert on Saturday, February 24th, 2018 at 6:00 pm at the College Place SDA Church. Jamie was born in Cuba and raised in a communist country. Jaime has a passion for proclaiming the gospel through his music. His gift of musical interpretation brings new life and excitement to every song. You will be inspired by his music and blessed as he shares his testimony. The Julianna Sayler Foundation is pleased to partner with Jaime Jorge in presenting this concert and in support of families fighting pediatric cancer. Retired Denominational Workers’ Annual Brunch, Sunday, February 11, 10:00 a.m., Alaska Room WWU Cafeteria. There will be a fee at the door for this Gala Event. Come with your spouse or a friend and enjoy a delightful program. HOWEVER, Reservation is required. Please call Bona Engen 509-522-4848. Your Input Requested in Selection of New UCC President: The North Pacific Union Conference is looking for your assistance as we select a new conference president for Upper Columbia Conference. The input from each church member in your family is valued in the selection process. A letter from John Freedman, president of the NPUC, explaining the presidential search process; and a survey for you to include your input is available here: https://sp.uccsda.org/news2018-01-23/ Thank you for taking the time to find out more about the selection process and if you desire, to also fill out the survey. You are invited to a New Student Visitation Day at Milton-Stateline Adventist School on Friday, March 9th 8:15 am to 10:00 am. We have Preschool to 8th grade. Free bus service to and from Walla Walla, Milton Freewater and College Place. Milton-Stateline Adventist School is having a FAIR! Our annual fair is filled with great things to eat and games to play is on Sunday, March 11th 4:00 pm to 7:00 pm. Great family fun! There will be vegeburgers, vege-corn dogs, nachos and drinks. The kids can ride the merry-go-round, go through the maze, have a pillow fight and play games for prizes! All the booths run on tickets. the tickets are 50 cents each. No admission fee. Anger & Desire Seminar with Pastor Richie & Timi Brower, February 9 - 10, College Place Village Church. Two of the most powerful relational allies any person can have are anger and desire. Richie and Timi will lead a biblical/behavioral exploration of these topics beginning Friday evening, 7:00 PM, in the chapel, continuing Sabbath morning, both services and concluding Sabbath afternoon, 2:00 PM, in the chapel. For seminar attendees, lunch will be a potluck style meal - bring your favorite dish. Attendance is free. Child care provided. For questions call 509-522-0882. SonBridge Dental Clinic is looking to fill the paid positions of Dental Assistant and Receptionist at 3 days/week. Call Mel Lang at (509) 301-3460 if interested. Join ASWWU Global Services for a “Night Under the Stars” on Sunday, February 11 at 6pm in the University Church Fellowship Hall. There will be a catered meal, live music, an art and flower auction, as well free babysitting. Prices are $25/person so come enjoy a stress free evening with your loved one and support a good cause. RSVP to the WWU Church office. Are you an Andrews University alum? Or are you a student considering attending Andrews University? Join us for a complimentary brunch at our Walla Walla regional event on Sunday, February 18 at 11 a.m. at the Marcus Whitman Hotel, 6 W Rose St, Walla Walla, Washington, 99362. Network with Andrews alums, enjoy a delicious meal, and hear the latest news from Andrews University. Reserve your spot (it’s free!) at alumni.andrews.edu/rsvp or by contacting us at (269) 471-3591, alumni@andrews.edu. We hope to see you there! Milton-Stateline Adventist School invites you to a Pancake Breakfast on Sunday, Feb. 4th, 8am to 10am, at the Stateline Adventist Church Fellowship Hall. There will be many delicious breakfast items to choose from. The cost is by donation. All the proceeds go to the 8th grade trip fund. See you there! ROSARIO SINGLES RETREAT April 5-8, 2018 in Anacortes WA. Marvin Wray, pastor of the Napa California SDA Church is our speaker for the weekend. His passion in ministry is to share the absolute assurance of God’s gift of salvation. Arrive Thursday and spend Friday on an Island Adventure in the San Juan Islands. Registration is $235 for the full retreat. Other registration options are listed on the registration form. For more details and a registration form, send an email to RosarioRetreat@Gmail.com. For those without access to email, you may call our registration line at 360 588-3179 to request info. The deadline to register is March 19, 2018. SONBRIDGE CONSTITUENCY MEETING will be held on Sunday Feb. 11, 2018 at 10:00 AM. The agenda will include inspiring financial and development reports of God’s blessings and an update of future plans. This constituency session is for designated delegates, but interested parties are welcome to attend! Thank each of you for your amazing support.